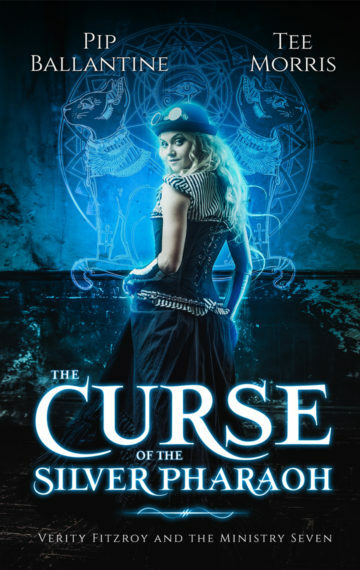 While Verity Fitzroy loses herself in magical mechanizations and fantastical science of London, she harbours secrets of the death of her parents, of a mystery she can’t leave alone, and of her power over machinery that both excites and terrifies her. Verity is part of the Ministry Seven, street orphans that work for Agent Harrison Thorne of the Ministry of Peculiar Occurrences. Under his guidance, a whole new adventure begins for them all, investigating the strange, the unusual, and the bizarre. When an Egyptologist from the British Museum is kidnapped, the only clue leads to the Delancy Academy, an elite school for gifted, young scientists. Now the Seven are called upon to go where Ministry agents cannot, and within the school Verity uncovers an ancient evil that could herald the end of the world. The Seven set down a dangerous path of intrigue, mystery, and murder; and find that ancient curses are especially difficult to contend with when you have Chemistry assignments due the next day. From the creators of the award-winning steampunk series comes a new adventure set in the Ministry of Peculiar Occurrences universe.